Kids can make some serious messes — but it turns out, there could be some major benefits to spaghetti art and pudding paintings. A recent study shows that the messier a child is, the more she is learning. When some new moms see a high chair, they imagine their child neatly enjoying meals of homemade baby food while emitting adorable coos and giggles. But when an actual baby sits in that pristine, cushy seat, it’s time to get down to business and make a serious mess. 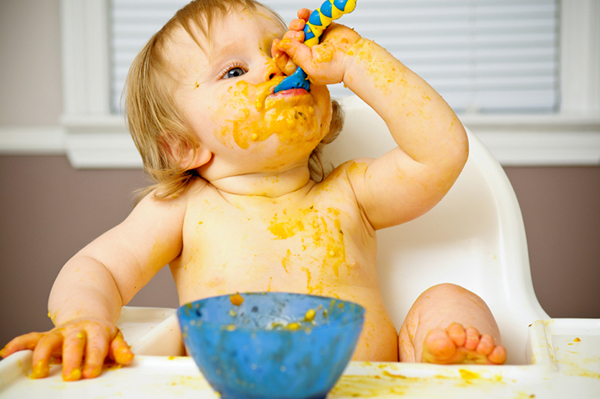 Mealtimes are notoriously chaotic when a baby is involved but moms everywhere can take solace in the fact that those colorful, sticky messes could actually be educational. We all know that children learn about solids and non-solids in science class, but the foundation of this knowledge can be established way before a child is old enough for school. Many parents help their young children learn to identify solid objects by allowing them to touch and feel a ball, cup, spoon or toy truck, but identifying non-solids can be a little trickier. A new study published in the journal Developmental Science shows that mealtimes are ideal for teaching about non-solid objects. When children are in a familiar setting — such as a high chair in the kitchen — and allowed to explore the wet, gooey, sloppy substances on their plate, they learn about textures, smells and colors while they are tossing, squishing and splattering whatever is in front of them. Larissa Samuelson is an associate professor of psychology at the University of Iowa. She has done extensive research on how children learn to identify objects with words and is the main author of the aforementioned study. She and her team gave 16-month-olds many different non-solid objects (such as pudding, applesauce and soup) to explore in various settings, paying careful attention to the ways in which they manipulated the substances and learned to associate specific words with each. Researchers concluded that the more a child became familiar with a certain material, the better they were able to identify it correctly. Should you put your toddler on a diet?